My Country I Still Call Australia Home: Contemporary Art from Black Australia was the Queensland Art Gallery|Gallery of Modern Art's largest exhibition of contemporary Aboriginal and Torres Strait Islander Art to date, held from 1 June to 7 September 2013. Curated by Bruce McLean, the exhibition examined the strength of QAG's collection while exploring three central themes- presenting Indigenous views of history (My history), responding to contemporary politics and experiences (My life) and illustrating connections to place (My country). 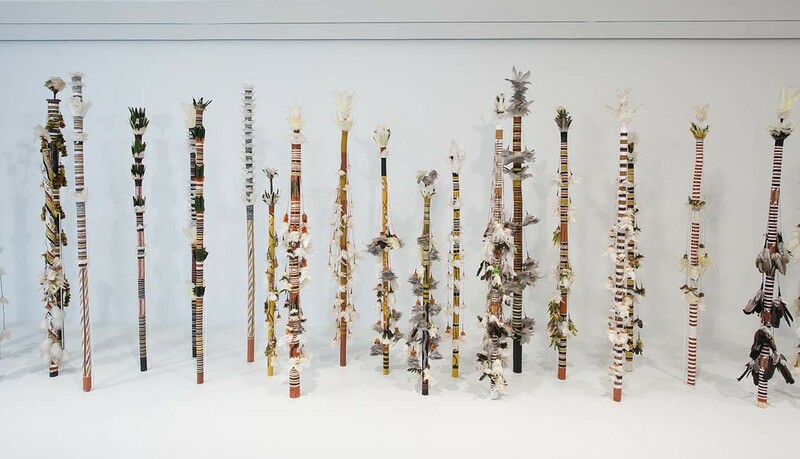 A large collection of Banumbirr (Morning Star Poles) formed a powerful display at Gallery of Modern Art. Artists featured were Richard Galngadiwuy, Richard Gandhuwuy Garrawurra, David Lakarriny Gurruwiwi, Gali Yalkarriwuy Gurruwiwi, Henry Dhalnganda Gurriwiwi, Paul Gurruwiwi, Trevor Barrara Gurruwiwi, Wilson Landydjurra, Henry Gambika Nupurra and Terry Dhurritjini, and the late Ian Wuruwul and Frank Djekula. Selected works from My Country I Still Call Australia Home: Contemporary Art from Black Australia are currently exhibited at Auckland Art Gallery Toi o Tāmaki from 28 March until 17 August 2014. Installation Images: Bamnumbirr featured in My Country I Still Call Australia Home: Contemporary Art From Black Australia, Gallery of Modern Art, Brisbane. Image courtesy Queensland Art Gallery|Gallery of Modern Art.